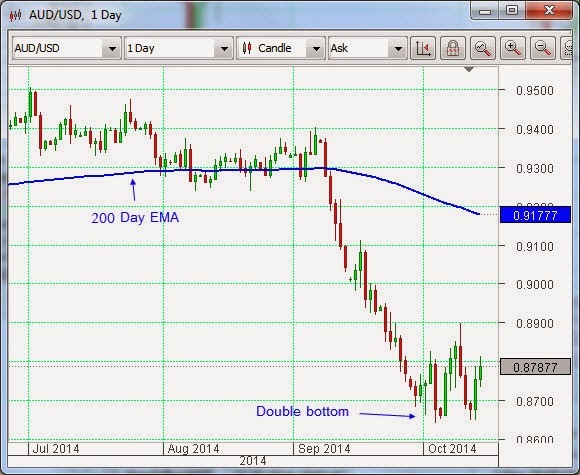 OmiCronFX : Good call on the Euro | Aussie on the turn? 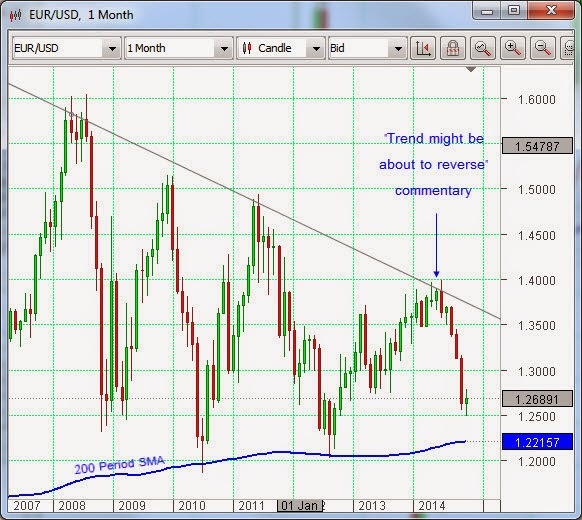 Good call on the Euro | Aussie on the turn? Early last April we pointed out in our commentary that the long term prospects for the Euro might support the idea of a reversal in the then upward trend. We based this on Technical Analysis of the EURUSD chart. The arrowed bar on the chart above indicates the date on which we made that comment, April 6th. Then, a short few weeks later, on May 8th, Mario Draghi stunned the Forex markets by announcing, after the May ECB monetary policy meeting, that the central bank was “comfortable” with the idea that a reduction in interest rates and / or other measures to battle low inflation might be implemented at the following month’s meeting, in June. The Euro has been falling ever since and, recently, that fall picked up momentum. Mr. Draghi was as good as his word. In the meantime, the US dollar gained a level of strength that reinforced the downward tendency for the pair. We also pointed out in May that the EURUSD exchange rate was bounded to the downside by the 200 period monthly Simple Moving Average (SMA). It has a little way to go to reach that again. Will the same Technical Analysis indicators work as well this time round? Now there are also decent technical and fundamental reasons why the Australian dollar might have bottomed out, at least for the near-term. The daily chart, above, is showing a clear double bottom, which is a price action pattern that is well respected. The extent of this double bottom also coincides with a strong support level that goes back all the way to late January of this year. On the fundamental side, there will be many traders around the world who will be thinking, hey, this Aussie dollar has fallen quite a bit – it looks oversold. One must then factor in the reality of a recent upturn in Chinese economic indicators, a stirring into life of hard commodity prices, like Iron Ore and the fact that Australia is one of the select club of countries that still enjoys a triple A rating on its debt. The major consideration, however, will be the recent comments from senior Fed officials in the USA to the effect that they are now worried about a strong US dollar and the impact this could have on economic recovery stateside. This, alone, could be the catalyst for a turn in the greenback against those major counterparts that have fallen heavily in recent times. And this would include the Euro.